Those who have mastered the steps of the Cellarius will find little trouble in dancing this elegant quadrille. It has five figures, and can be performed by any even number of couples. The music, like the step, is that of the Mazurka. The couples are arranged as in the ordinary quadrille. Join hands all round; grand rond to the left (four bars), then back again to the right (four bars), employing the second step of the Cellarius. 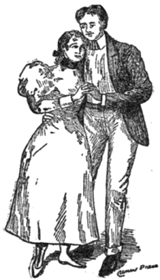 Each couple does the petit tour forwards, and backwards, still using the second step, and repeating it three times to the right—then resting a bar; three times to the left—then resting another bar; which occupies eight bars of the music. These figures may be considered as preliminary. We find the quadrille itself so well described in the work of a contemporary, that we cannot do better than extract the account in full, for the benefit of our readers. 1st Figure.—Top and bottom couples right and left (eight bars), with Redowa steps; then they advance, the ladies cross over, the gentleman meanwhile pass quickly round each other, and return to own places (four bars); petit tour forward with opposite ladies (four bars); right and left (eight bars); advance again; the ladies return to own places, and the gentlemen pass again round each other to their own ladies (four bars); petit tour backward (four bars). Side couples do likewise. 2nd Figure.--(Eight bars rest.) Top and bottom couples advance and retire, hands joined (four bars). All cross over into opposite places, each going to each other’s left (four bars); petit tour forward (four bars); advance and retire (four bars), and return to places (four bars); petit tour (four bars). Side couples do likewise. 3rd Figure.--(Eight bars rest.) Top and bottom ladies cross over into opposite places (four bars); return, presenting left hands to each other, and right hands to partners, as in La Poule (four bars); pass round with partners into opposite places (four bars); _petit tour_ backward (four bars); vis-à-vis couples hands across, round (six bars); retire (two bars); top and bottom ladies cross over (four bars); ladies cross again, giving each other left hands, and right to partners (four bars). All pass round to own places (four bars); _petit tour_ backward (four bars). 4th Figure.--(Eight bars rest.) Top couple lead round inside the figure (eight bars); petit tour forward and backward (eight bars); advance to opposite couple; the gentleman turns half round without quitting his partner, and gives his left hand to opposite lady; the two ladies join hands behind gentleman (four bars); in this position the three advance and retire (eight bars). The gentleman passes under the ladies’ arms; all three pass round to the left, with second step of Cellarius, the opposite lady finishing in her own place (four bars). The top couple return to places (four bars); petit tour forward (four bars). Opposite couple and side couples do likewise. 5th Figure.--(Eight bars rest.) Top and bottom couples half right and left (four bars); petit tour backward (four bars); half right and left to places (four bars); petit tour backward (four bars); vis-à-vis couples hands round to opposite places (four bars); petit tour forward (four bars); hands round to own places (four bars); petit tour (four bars); right and left (eight bars). Finale. Grand round all to the left, and then to the right (sixteen bars); grand chain, as in the Lancers, with first step of Cellarius (sixteen bars). But if there are more than eight in the quadrille, the music must be continued until all have regained their places.